If you were asked to put together an anthology album of one of the longest-lived, most productive rock groups ever, and you had the total output of the group to choose from, I'll bet you wouldn't come up with anything remotely resembling this album. It's not that the obvious selections aren't included, it's that so little else is. With some imagination and commitment, The Best of the Byrds might have been the equal of the group's first anthology, The Byrds' Greatest Hits, surely one of the most satisfying collections ever put together. That first album made itself, of course; at the time it was put together (late 1967), there were only four albums to pick from, and to leave off any of that album's 11 selections would have been an obvious and unthinkable goof. This time there was some room to stretch out; when this project was planned, there were a dozen albums, and all but the early hits -- like "Mr. Tambourine Man," "Turn! Turn! Turn!," "Eight Miles High," and "So You Want to Be a Rock and Roll Star" -- were ripe for the picking. With this wealth of material to choose from, you'd think it would have been difficult to hold this collection down to a double or even a triple LP set. But the selectors evidently had to strain to come up with 11 songs to fill this rather short single LP. If it hadn't been for the best-selling Easy Rider soundtrack album featuring the Byrds, they might not have managed that many. Including "He Was a Friend of Mine," from the second album, set the precedent of drawing material not just from the five albums made by the newer Byrds, but from the whole span of the group's recording. But that's only one from the early stages. There's no "Renaissance Fair," "Have You Seen Her Face?," "Everybody's Been Burned" or any of the other beautiful, art-rock songs from the Fifth Dimension - Younger Than Yesterday period; no "Why?," "It Won't Be Wrong," or any of the other driving rock songs nobody remembers anymore that the Byrds know how to do. The only cut from the classic fifth album, Notorious Byrd Brothers, is "Wasn't Born to Follow" (that one was in Easy Rider, remember? ), and the only one from the equally classic Sweetheart of the Rodeo, their wonderful treatment of Dylan's "You Ain't Goin' Nowhere." But the biggest sin is Columbia's exclusion of three songs that were never on any album: Gene Clark's "She Don't Care About Time," which, as much as any song, epitomizes the style of the original Byrds; "Ladyfriend," the best David Crosby song ever; and the manic, mesmerizing original version of "Why?" that was the B side of "Eight Miles High." These singles would certainly have been as valuable as selections on The Best of the Byrds as any of the album tracks included, particularly now that they are no longer available in any form. But apparently nobody at Columbia knew or cared enough to dig the vaults and pull them out for this album. McGuinn's more recent version of the Byrds has been together now (more or less) for over four years, and that's longer than the original Byrds lasted. At certain points, they were a superlative band. So I'll concede that the emphasis in this collection should be on them. But the record company displays no more awareness of the newer Byrds than it does of the original group. "Chestnut Mare" and "Jesus Is Just Alright," the closest things to hits this bunch of Byrds has recorded, are included, as they must be. But so are the less worthy "Ballad of Easy Rider" and "Drug Store Trick Drivin' Man" (a C&W parody that doesn't hold up). There are two tracks from Skip Battin, the Byrds' third bassist (who's been absent from recent performances, with original Byrd Chris Hillman in his place): "Citizen Kane," which works because of its sentiments, and "America's Great National Pastime," which fails because of its contrivances; and two undistinguished recent tracks by McGuinn, "Tiffany Queen" and "I Want to Grow Up to Be a Politician." But there isn't a single track by the by-now old standbys lead guitarist Clarence White (who's been on every Byrds album since the fourth) and drummer Gene Parsons (recently replaced by John Guerin, who has just been replaced by Joe Lala). Gene's "Gunga Din" is the best flight song the Byrds have done since "Mr. Spaceman," but it's nowhere to be found. White's singing on tracks like "Bugler," Jamaica," and "Truck Stop Girl" has been more compelling than any of McGuinn's vocals on the last couple of albums, but none of these are here either. Despite the mindlessness behind the preparation of the album, the first half holds together rather well. If side one is random but listenable, then the second side, which ends with the three cuts from the last two mediocre albums, runs like a convincing synopsis of the group's decline. 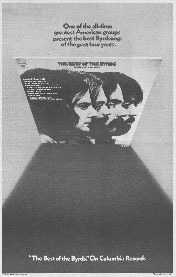 If this album was all you had to go by, you might think that McGuinn and Battin shared the leadership of the group (and Battin was the only Byrd, past or present, who never managed to work his own style in with the overall style of the group); that the Byrds' interest in country music has been purely satiric (there's not a sign of Gram Parsons, the force behind Sweetheart ); that White and Gene Parsons have been no more than anonymous back-up musicians; and that the Byrds eventually developed into a dime-store American version of the Bonzo Dog Band. I hope not too many unwary listeners draw any of these conclusions from The Best of the Byrds. Believe me, this isn't it. - Bud Scoppa, Rolling Stone, 4/12/73. - Robert Christgau, Christgau's Record Guide, 1981.
and buy this album at Amazon.com. independent music sellers around the world. CDs, vinyl and tapes at eBay.